the happygirl: review: "life of pi"
From the exquisite trailers of Academy Award winning director Ang Lee's ("Brokeback Mountain" and "Crouching Tiger, Hidden Dragon") new film "Life of Pi" it would be fair to say that this new film is breathtaking with imagery so realistic and sparkling that it practically glows off the screen. 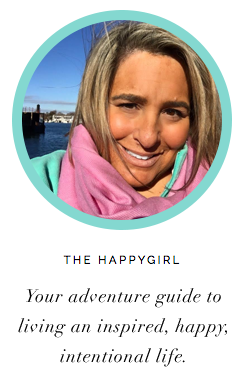 One would expect that, of course, given the lovely, feel-good, beautiful clip from "Life of Pi," the film based on the beloved novel by Yann Martel. Yes, it is beautiful but what the trailer doesn't show are the disturbing scenes that caused me to apologize several times to my guest at the recent screening who started crying after the first half hour of the film and didn't stop until the credits rolled. "Life of Pi" is the story of Pi (newcomer Suraj Sharma) who lives an idyllic existence with his family on the property of their charming zoo in India. The opening of the film indeed is magical, from the music to the scenes of animals scampering amidst the beautiful habitat with blooming vegetation. His parents, however, deciding on a better life for their sons, decide to close their zoo and take Pi and his brother to Canada along with the animals. It's when they board an Asian cargo ship that the film takes its dark turn. Imagine the Titanic sinking with animals. And this is when I closed my eyes. The images of people and animals desperately trying not to drown in the middle of a storm in the Pacific was disturbing. I looked away from the screen and tried to remember that this was just a movie. Pi does make it onto a lifeboat along with a zebra who flings itself off the sinking ship into the boat along with several other animals. Surprised? Because in the trailer you only see a Bengal Tiger curiously named Richard Parker and none of the other animals? Right? True. It's what happens to those other animals that make some of the scenes almost intolerable to watch. If you have any sensitivity to animals, parts of this movie may be very disturbing to watch. They were to me. I thought of my three young nieces (ages 9-13) and I knew that they would be burrowing their heads into my chest during some of the more aggressive scenes. I get it. I do. It's a story of Pi's survival as a boy lost on a lifeboat in the middle of the Pacific and well, things need to happen in order for the film to have an arc. 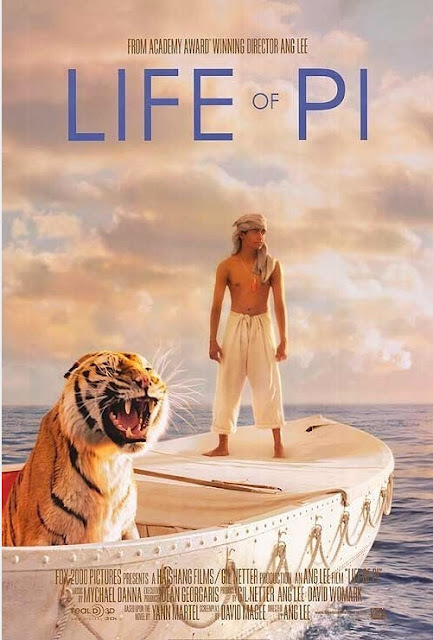 To help move the story along, the film cuts back and forth between Pi (and his nemesis, the tiger) on the lifeboat and his desperate quest to survive to Pi in the present day (Irrfan Khan) relating his story to a journalist (Rafe Spall). It is heart-wrenching watching Pi on the lifeboat, struggling to survive against not only the unforgiving sea but also a giant, powerful predator as he rages against God, against Richard Parker and against his circumstances. As a juxtaposition, there are some scenes, however, that are magnificent (especially the underwater scenes). They are what you would expect from a director like Ang Lee. There is great beauty and great loss. There is strength when things seem hopeless. Like in life. As the credits rolled and teary sniffles were heard throughout the theatre I thought about what I had seen. I appreciated the cinematography and the extraordinary acting on behalf of Suraj Sharma (who was brilliant) but I felt a bit melancholy and introspective. This was a film that was going to take some time to leave me.